Forgotten New York has many parents. I have said before that the kernel may have been planted in 1962, when the Department of Traffic tore down all the castiron lampposts along 6th Avenue in Bay Ridge, replacing them with Donald Deskeys, and the entire stretch of row houses across the street were torn down so a trench that ultimately became the Gowanus Expressway leading to the Verrazano Bridge could be built. But, Forgotten New York may also have been inspired by all those hours I spent meticulously poring over the Little Red Book. Not the mass murderer and Chinese dictator Chairman Mao’s manifesto, but rather the listings of streets published by Geographia Maps to go along with their excellent maps of NYC and environs. (Hagstrom, great as they were, never embarked on such an endeavor.) They were inevitably encased in red paperback covers and eventually adopted the Maovian moniker. I would carefully scan the lists for any obscure alley or any street that was no longer there, spending hour after hour in the process. I would copy them into notebooks in an increasingly smaller and more crabbed hand. However, when I started bicycling around Brooklyn and later moved to Queens and then began Forgotten New York and roved all over town in search of Forgotten stories, the word was made flesh, so to speak, when I finally got a look at the roads and streets previously seen only as lines on paper. Now, what appeared exotic when rendered on paper can sometimes seem much more mundane when seen in reality; and such is the case with Weeks Lane. Since moving to Queens in 1993 I have had an interest in Queens’ oldest roads, many of which are still in place tracing the same routes, and still with their old names. I have done pages on Rocky Hill Road, which once encompassed large parts of Braddock Avenue, Bell Boulevard and 48th Avenue (tracing the old routes of old roads can sometimes be akin to tracing the lineage and evolutionary history of familiar animals, discovering that whales sprung from a long-lost hoofed mammal), as well as Old South Road, which has been largely obliterated by the Belt Parkway, though there are still bits and pieces of it. 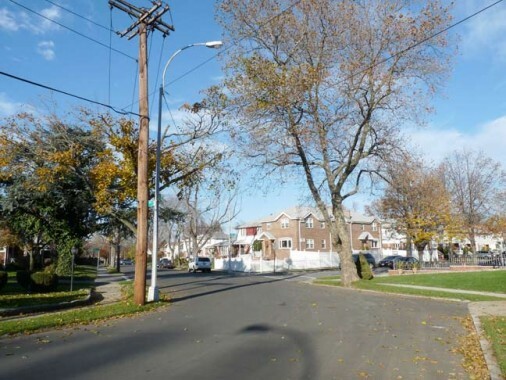 Weeks Lane, which is in eastern Auburndale or northern Fresh Meadows depending on which neighborhood chooses to claim it, is a squiggle on the otherwise orderly street grid imposed in the first decades of the 20th Century. It runs from Hollis Court Boulevard and 196th Street northeast, bending and turning as it goes, to a remaining piece of Rocky Hill Road and 201st Street. I have traced its history in maps. In have circled the depiction of Weeks Lane on this plate of mid-Queens in an 1873 Beers atlas. Most of the roads you see shown here still exist but have different names, many of which I wish had been kept. I like Hollis Court Boulevard’s present name, which beats its old name, Queens Road. But you can’t beat Blackstump Road, which was given the more orderly 73rd Avenue, because it comes after 72nd and ahead of 74th. The “Rail Road” in the middle of the map was the Central RR of Long Island, built by Scottish department store king A.T. Stewart. He built Garden City and the railroad that ran from there to Flushing. 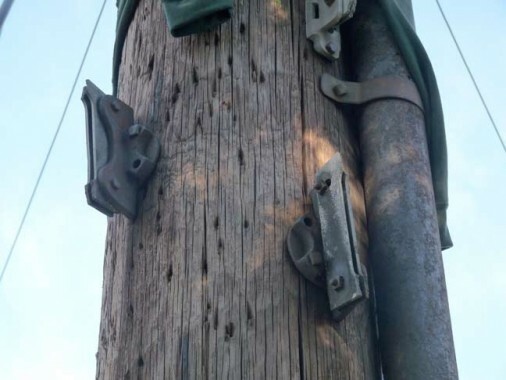 But few used it, and it lasted just two years. 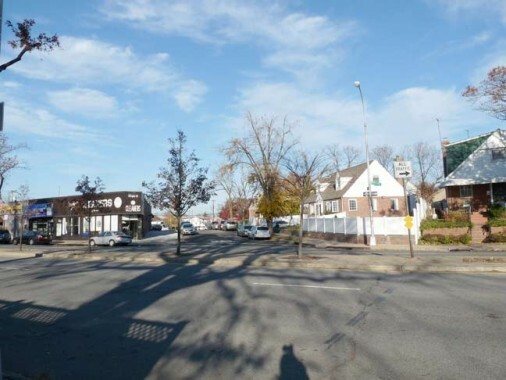 At this time, what would be Fresh Meadows was a collection of farms. 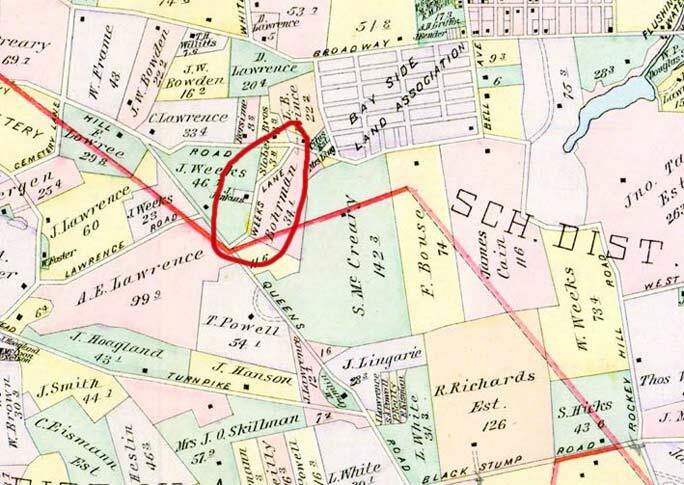 A few have wound up on atlases after streets were named for the farms they ran past, but only the Weeks name survived to the present, as well as Lawrence. 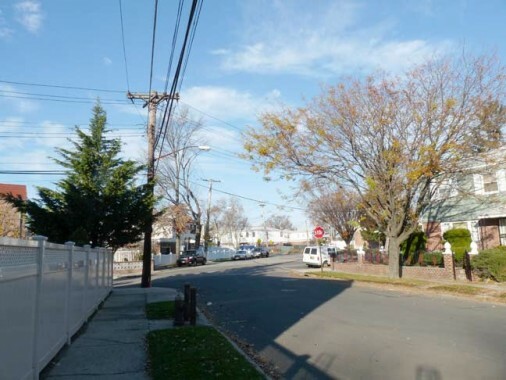 The Lawrences were a prominent and powerful Queens family, three of their family cemeteries still survive, and before 1969, much of College Point Boulevard was called Lawrence Street. On this 1891 map the farms are more skillfully depicted, as each gets a different color. Note the “J. Weeks” adjoining Weeks Lane. The Weeks farms in the area were by then owned by Jacob C. Weeks. The Bayside Land Association was the first sign of residential development. The suburbs were beginning. Still, by 1909 there wasn’t a lot of development yet, but many of the farms had been bought up or consolidated with others. 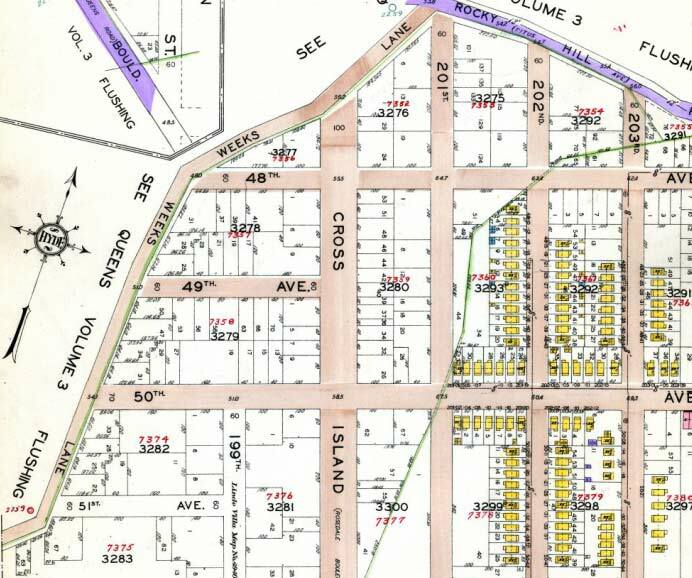 The last old map in the series is by Belcher-Hyde and shows the area in 1928. Development has come to town and streets have been laid out and some frame houses, many of which are still there, have been built. On this plate, brown indicates that the street has been opened but not yet paved (purple roads were paved). Perhaps Weeks Lane was retained because it offered a neat shortcut against the overall grid plan. 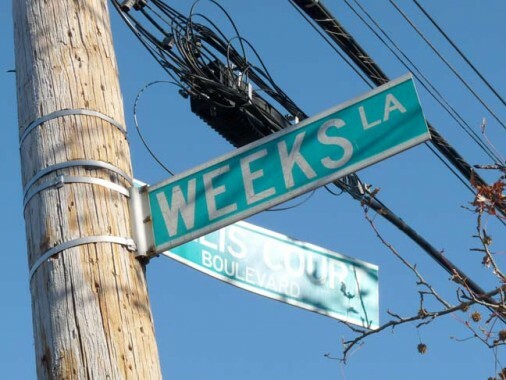 Here is Weeks Lane at its starting point at Hollis Court Boulevard. 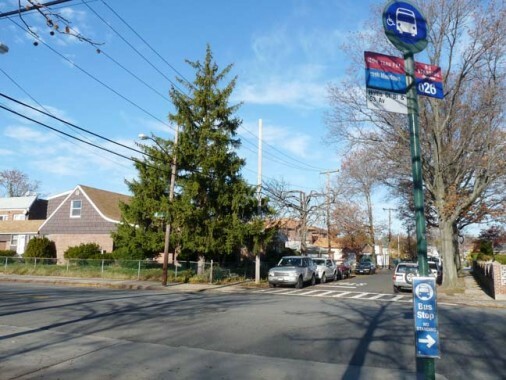 (The many Hollises found on place names in Queens is a mystery I haven’t yet solved.) Jacob C. Weeks, whose holdings were related as 20.29 acres in 1909, probably didn’t imagine that his name would still be mentioned in Queens a century later. One of Weeks Lane’s three bends. The second of the three. A couple of brackets for old street signs. In the early 20th Century Queens street signs listed the new name on the top line (usually this was a number) and the old name in smaller letters on the bottom. I imagine Weeks Lane signs only had one name. Weeks Lane traffic is interrupted by Francis Lewis Boulevard, formerly Cross Island Boulevard (and probably renamed for Queens’ only Signer of the Declaration of Independence after Cross Island Parkway was built in the 1930s). 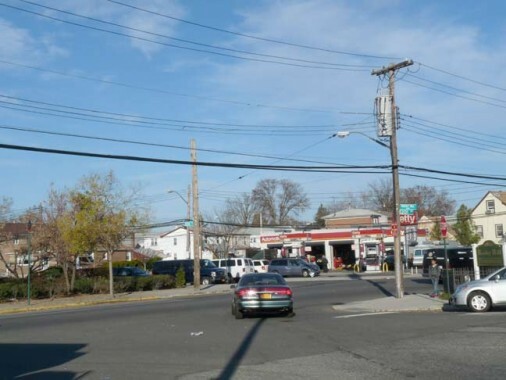 Weeks Lane ends at a gas station plaza on Rocky Hill Road and 201st Street. 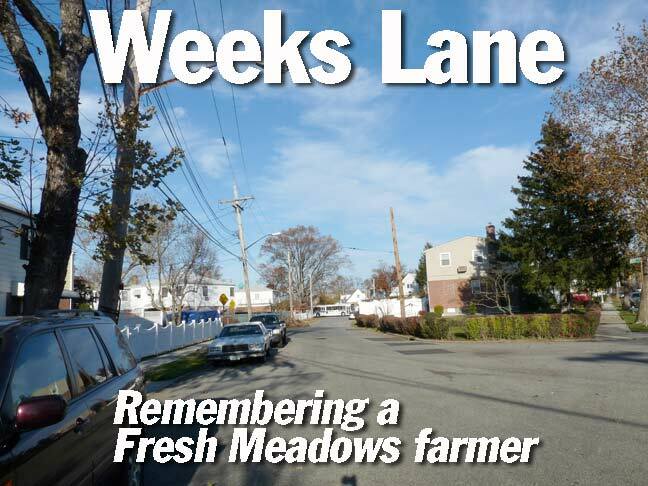 In a borough that has largely renamed itself, Weeks Lane carries on as always. My all time Queens favorite name is “Shoe and Leather Street” in Ozone Park which is now just a boring numbered road. Kevin, thank you for another year of Forgottening (if that is not a word it should be). 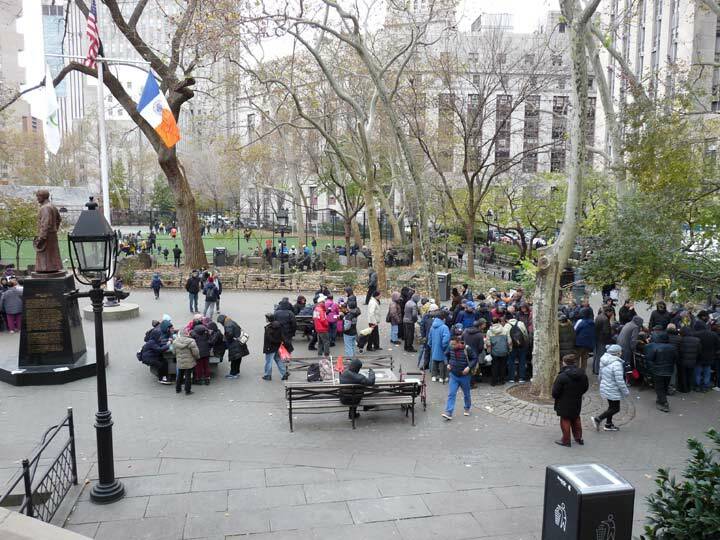 Is there any part of the city you have not covered that you want to? It is always fun following you around the city. Have a safe and happy New Year. Very neat page! Love the farm maps! Happy New Year, Kevin! Looking forward to another year of learning from your website…. 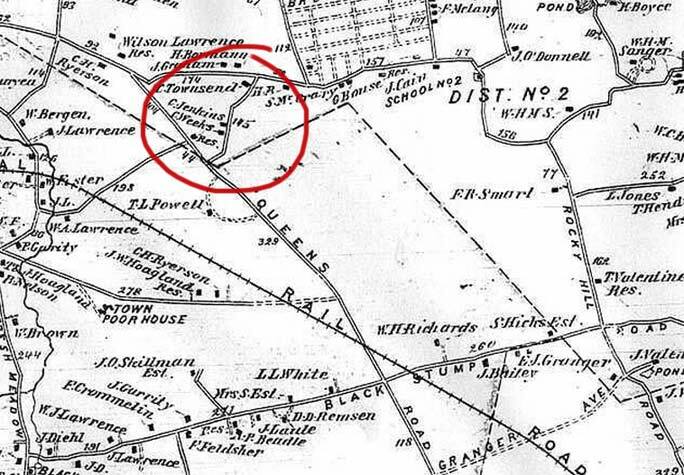 Two quick questions: on the 1873 map, any historical information on what is noted as the “Town Poor House”? 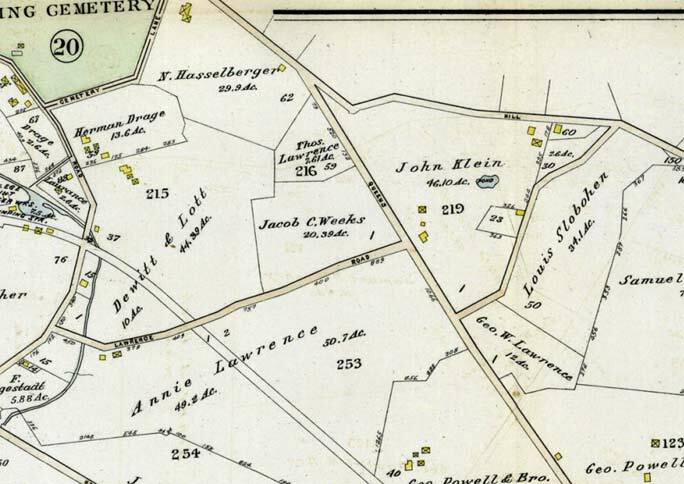 -and- on the 1909 map, what is the cemetery at the upper left? The cemetery is Flushing Cemetery which is still there. The poor house is long gone, though I may need one before too long. Has the Bay Side Land Association been assumed by the grid, or does its streets, if still extant, lie askew of the grid? There is a Jacob C. Weeks (1820-1856) buried in the Gravesend Cemetery. Probably just a coincidence! I remember the Red Book. It had just about every kind of detail, such as addresses at intersecting streets and bus line information. I have lived on Weeks Lane for 22 years!!!!! This area has been hit hard by multi-family, barracks-style, crap construction recently.